Last month ProcureWare had its second major release of the year. One significant enhancement is the implementation of Two-Way Messaging. In each case, the buyer can send an email to the vendor, the vendor replies via their standard email, and the reply is automatically forwarded to the buyer’s email. The email chain can continue with requests for further clarification from the buyer and responses from the vendor. All the communication happening outside of ProcureWare is automatically logged in ProcureWare and associated with the related bid, contract, and/or company. The new Two-Way Messaging feature is just one example of how ProcureWare transforms sourcing operations to save buyers time, foster greater collaboration, reduce risk, and increase transparency. 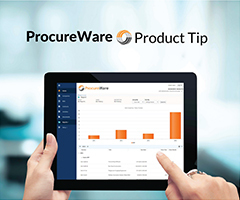 Like all ProcureWare features and modules, it is available at no extra cost to ProcureWare users.